If you’ve been trying to find 800 numbers for sale, look no further. UniTel Voice has 800 numbers for sale in every available toll free prefix on the toll free prefixes list. If you are going to buy toll free number services, you should check out our affordable 1 800 phone numbers for sale with fast and easy activation. However, since the toll free prefix 800 has been virtually used up by existing businesses you may have to get a toll free number with a different prefix such as 888, 877, 866, 855, 844 and now 833. In any case, UniTel Voice has many different toll free number plans loaded with time and money saving features that will help your small business look and sound professional. 1. Where can I find affordable 1800 numbers for Sale? 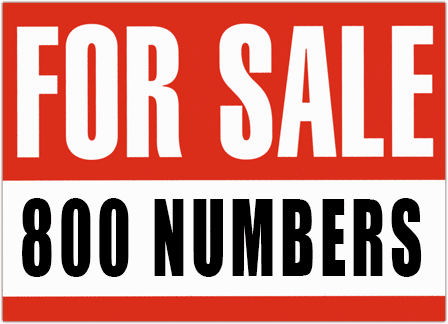 There are three typical places to find 1800 numbers for sale. These include marketing firms, independent agents, and RespOrg toll free service providers. The first two options are typically toll free service resellers which can be pricey especially when it comes to hard to get numbers. In any case, when purchasing a toll free number you will ultimately have to be serviced a by a phone company that is an official RespOrg because of FCC rules. In other words, the number must be in use or it will have to return to the spare pool so another business has the opportunity to snap it up. 2. Where can I find affordable toll free numbers for Sale? You can find toll free numbers for sale in many places, phone companies, marketing companies, and independent dealers. The toll free numbers for sale you will typically find from marketing companies are vanity 800 numbers. If you decided to purchase vanity toll free numbers from one of these dealers you will have to move that toll free number to a phone company for ongoing service. 3. Where can I find affordable vanity 800 numbers for Sale? Finding vanity 800 numbers for sale is not easy. The prefix 800 has been virtually used up by other companies. However, UniTel Voice’s custom toll free number search tool allows you to find every possible available vanity toll free number for sale because our search tool pulls any/all available numbers directly from the SMS800 national database, which has been renamed, Somos. 4. Can I buy 1-800 numbers from UniTel Voice? Yes, you can purchase toll free numbers (with phone service) from UniTel Voice in any toll free area code including 888, 877, 866, 855, 844, 833 and the classic/most recognized toll free number of all, “800”. You may purchase the number and transfer it to a phone company of your choice or use our industry-leading toll free service to host your number and prove you with our amazing phone system features. 5. What factors should you consider when purchasing an 800 number? When you are buying 800 numbers you should keep three things in mind: pricing, call quality, customer service, and features. UniTel Voice happens to be very competitive on all four but strives to be the leader in customer care. Whether you’re a large or small business, our customer support team understands the important role your toll free service and business phone system plays in helping you grow. We priced to grow with your business, our features allow you to run your business from anywhere, our network infrastructure is top of the line and our team (of real people) is here to personally assist you. 6. Does UniTel Voice have vanity numbers for sale? Yes, UniTel Voice has real-time access to a massive database of available toll free numbers. We’ve also built a tool that allows you to such that database via numbers or words. If you find a number you want to buy you can instantly reserve the number and within a short time, it will be ringing live on your account. In addition to a large selection of available vanity numbers, our pricing is typically the best you’ll find by far. 7. Why is it so hard to find available 1-800 numbers? There are two reasons it’s so hard to find 1-800 numbers. The first reason is simply that true 800 numbers first became available in the 1960s, therefore most every 800 number is in use with another company. The other reason is some shady companies snap up 800 numbers so when people call the number it redirects them to a commercial to purchase something or signup for a special offer. Unfortunately, when the offer expires often times the 800 number stops ringing through. In these cases, the number sounds disconnected however they are technically still in use, and trying to find the account owner is nearly impossible. Even if you figure out who the phone company is that is hosting the number they company will not give you the account owners contact info because customer information is kept private. The phone company could get in trouble. There are a lot of available toll free numbers stuck in limbo in this situation.